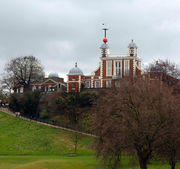 Royal Observatory Greenwich Was One Of The First Observatories To Study The Universe. Greenwich Royal Observatory was built in 1675. 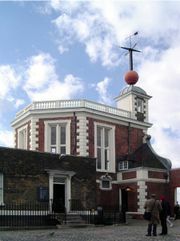 The Royal Observatory, Greenwich was commissioned in 1675 by King Charles II. The Royal Observatory, Greenwich used to be named Royal Greenwich Observatory. At this time the king also created the position of Astronomer Royal (initially filled by John Flamsteed), to serve as the director of the observatory and to "apply himself with the most exact care and diligence to the rectifying of the tables of the motions of the heavens, and the places of the fixed stars, so as to find out the so much desired longitude of places for the perfecting of the art of navigation." It is situated on a hill in Greenwich Park in Greenwich, London, overlooking the River Thames. History of the Royal Observatory Greenwich. Royal Observatory Greenwich. Notice the time ball atop the Octagon Room. 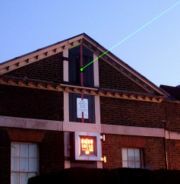 Laser projected from the observatory marking the Prime Meridian line. Former Royal Greenwich Observatory, Herstmonceux East Sussex. 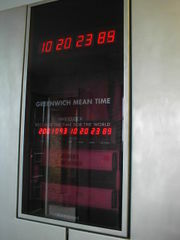 One of the hyper-accurate chronometers at the Greenwich observatory. Flamsteed House, the original part of the Observatory, was designed by Sir Christopher Wren probably with the assistance of Robert Hooke and was the first purpose-built scientific research facility in Britain. It was built for a cost of £520 (£20 over budget) out of largely recycled materials on the foundations of Duke Humphrey's Tower, which resulted in the alignment being 13 degrees away from true North, somewhat to Flamsteed's chagrin. It housed not only the scientific instruments to be used by Flamsteed in his work on stellar tables, but over time also incorporated a number of additional responsibilities such as the keeping of time and later Her Majesty's Nautical Almanac Office. Two clocks, built by Thomas Tompion, were installed in the 20 foot high Octagon Room, the principal room of the building. They were of unusual design, each with a pendulum 13 feet (3.96 metres) in length mounted above the clock face, giving a period of four seconds and an accuracy, then unparalleled, of seven seconds per day. British astronomers have long used the Royal Observatory as a basis for measurement: four separate meridians have been drawn through the building. The basis of longitude, the Prime Meridian, established in 1851 and adopted at an international conference in 1884, passes through the Airy transit circle of the observatory. It was long marked by a brass strip in the courtyard, now upgraded to stainless steel, and, since December 16, 1999, has been marked by a powerful green laser shining north across the London night sky. This old astronomical prime meridian has been replaced by a more modern prime meridian. When Greenwich was an active observatory, geographical coordinates were referred to a local oblate spheroid called a datum, whose surface closely matched local mean sea level, called the geoid. Several datums were in use around the world, all using different spheroids, because mean sea level undulates by as much as 100 metres world-wide. Modern geodetic reference systems, such as the World Geodetic System and the International Terrestrial Reference Frame, use a single Earth-centered oblate spheroid. The shift from several spheroids to one world-wide spheroid caused all geographical coordinates to shift by many metres, sometimes as much as several hundred metres. The Prime Meridian of these modern reference systems is about 100 metres east of the Greenwich astronomical meridian represented by the brass strip. Greenwich Mean Time (GMT) was at one time based on the time observations made at Greenwich (until 1954). Thereafter, GMT was calculated from observations made at other observatories which were still active. GMT is now often called universal time, which is now calculated from observations of extra-galactic radio sources, and then converted into several forms, including UT0 (UT at the remote observatory), UT1 (UT corrected for polar motion), and UTC (UT in discrete SI seconds within 0.9 s of UT1). To help others synchronize their clocks to GMT, a time ball was installed by Astronomer Royal John Pond in 1833. It still drops daily to mark the exact moment of 1 p.m. (13:00) year round (GMT during winter and BST during summer.). Today the buildings include a museum of astronomical and navigational tools, notably including John Harrison's prize-winning longitude chronometer, H4 and its three predecessors. It is also home to the 28-inch Grubb refracting telescope the largest of its kind in the UK. The Shepherd Clock outside the observatory gate is an early example of an electric slave clock. In February 2005 construction work began on a £15 million redevelopment project which will provide a new planetarium and additional display galleries and educational facilities. Royal Observatory, Greenwich Vs Royal Greenwich Observatory. During much of the twentieth century, the Royal Greenwich Observatory was not at Greenwich. The last time that all departments were there was 1924: in that year the arrival of the railway affected the readings of magnetic And Meteorological Department and forced its move to Abinger. In 1939, during World War II, many departments were evacuated, along with the rest of London, to the countryside (Abinger, Bradford, and Bath) and activities in Greenwich were reduced to the bare minimum. After the War, in 1947, the decision was made to move to Herstmonceux Castle and 320 adjacent acres (1.3 km²) (70 km south-southeast of Greenwich near Hailsham in East Sussex) due to light pollution in London. Although the Astronomer Royal moved to the castle in 1948, the scientific staff could not move until the completion of new observatory buildings in 1957. Shortly thereafter, other far flung departments were reintegrated at Herstmonceux. The Isaac Newton Telescope was built at Herstmonceux in 1967, but was moved to Roque de los Muchachos Observatory in Spain's Canary Islands in 1979. In 1990 the RGO moved again, to Cambridge. Following a decision of the Particle Physics and Astronomy Research Council, it closed in 1998. Her Majesty's Nautical Almanac Office was transferred to the Rutherford Appleton Laboratory after the closure. Other work went to the UK Astronomy Technology Centre in Edinburgh. The castle grounds are now the home of the International Study Centre of Queen's University, Kingston, Canada and the Observatory Science Centre. Chronology of the Royal Observatory, Greenwich. Royal Observatory, Greenwich c. 1902 from old postcard. 1675 Royal Observatory, Greenwich founded. 1924 Hourly time signals (Greenwich Time Signal) from the Royal Observatory, Greenwich were first broadcast on February 5. 1948 Astronomer Royal moves to Herstmonceux. 1957 Royal Observatory completes its move to Herstmonceux, becoming the Royal Greenwich Observatory (RGO). The Greenwich site becomes the Old Royal Observatory. 1990 RGO moves to Cambridge. 1998 RGO closes. Greenwich site becomes the Royal Observatory, Greenwich again, and is part of the National Maritime Museum. Further reading about Royal Observatory, Greenwich.